What better way to celebrate and benefit a charity like Real Medicine FoundationÂ than to pair pizzas with beer? Real Medicine is a charity which provides humanitarian support to people affected by disaster, post-war, and poverty – and Gev Kazanchyan & Stone Brewing Co. led the charge for their benefit one Sunday afternoon at Citysip, a local wine bar located in Echo Park on Sunset. The result was an impressive $1000 check towards research whereby we guests tasted delicious beers with pizzas delivered fresh every single round by Tomato Pie. We started out with a palate cleanser – Stone Levitation Ale. I don’t know if it’s so much a palate cleanser so much as a beer that simply tastes good. But sure, it’s not heavy – still is a Stone (i.e. strong) brew so it has some weight to it -Â and therefore, a good beer to whet the senses. The first Tomato Pie pie came out, which was of a breakfast sort with bacon, sausage, spinach, white onion and egg as toppings. I can usually eat breakfast any time of day yet – lo and behold – I had been sleeping on a cemetery lawn a few hours prior. It seemed a proper way to wake amongst the dead. But Stone’s Smoked Porter is one of my favorite beers, and it was a nice, rich start to the tasting and matched the sausage on the pizza well. 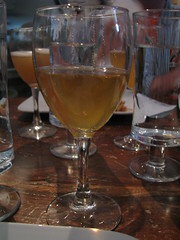 The next beer was a selection from The Bruery, The Orchard White. 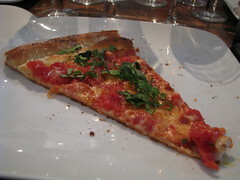 Their names also synced well, with the Grandma Pizza topped with crushed marinated tomato, garlic, basil and parmesan. It was good to step it up to a pie with more herbs. The coriander and lavender notes in the Orchard White, with it being such a fragrant beer, were really brought out by the basil on the pizza. A really nice combination. Next was my favorite pairing of the afternoon, a grilled vegetable pizza (roasted garlic, soy balsamic, grilled vegetables and goat cheese) with The Bruery’s Saison Rue with 8.5% ABV. 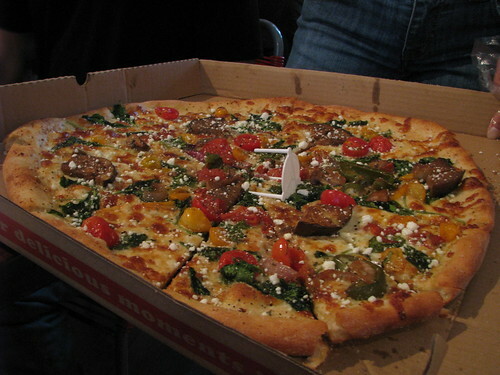 The pizza was certainly excellent, with the vegetables tasting extra fresh and the tomato sauce sweet. Since the Saison Rue is a citrusy, hoppy beer – a delicious one, at that – it was a nice way to offset the natural sweetness of the pie. The next combo wasn’t a hit, perhaps because of some of my own admitted prejudices. A chicken and garlic pesto pie was paired with the hoppy Ruination IPA from Stone. I am a pasta lover but not so much a pesto lover, though it may be a case of not having had my share of quality sauces and/or methods with which to cook pesto. But the even harder sell may have been the chicken on pizza. I don’t like chicken on pizza much, except for a few, special BBQ chicken recipes. (I don’t much like chicken dumplings, either. I think pork rules that realm.) The Ruination is a good beer for hoppyheads, though. Like the Saison Rue, the Avant Garde from The Lost Abbey is a Belgian/French-style farmhouse ale with 7.0% ABV and quite delicious. There’s a gold color to it andÂ I tasted honey – which might have worked in theory with a dessert pizza. Unfortunately, I wasn’t a fan of this particular recipe which had toppings of prosciutto, plantaines, pine nuts and brown sugar with honey. The plantaines were probably cooked too long or should have been glazed – not much flavor was left in them. 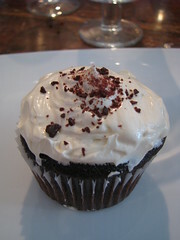 The real dessert treat, however, was a irish car bomb cupcake with Baileys-infused frosting. Delicious!! I could also taste the Baileys. 😉 Overall, it was an enjoyable pairing experience. It will be plentyÂ difficult to have pizza without thirsting for beer in the future. This entry was posted in Echo Park, Food, Silver Lake and tagged beer, Citysip, CitysipLA, Dionicess, Echo Park, Gev Kazanchyan, Lost Abbey, pairing, pizza, Real Medicine Foundation, Silver Lake, stone brewing company, sunset blvd, tasting, The Bruery, Tomato Pie, wine bar. Bookmark the permalink.